It looks like Jersey Mike's has worked out the past due rent issue with the leasing company and are now back open. Another restaurant couldn't make it the new Faith Village shopping center. If you were in the mood for a sandwich this afternoon, looks like you're gonna have to go somewhere else. A note was placed on the front door of Jersey Mike's Subs and the owner of the building has changed the locks on the front door. 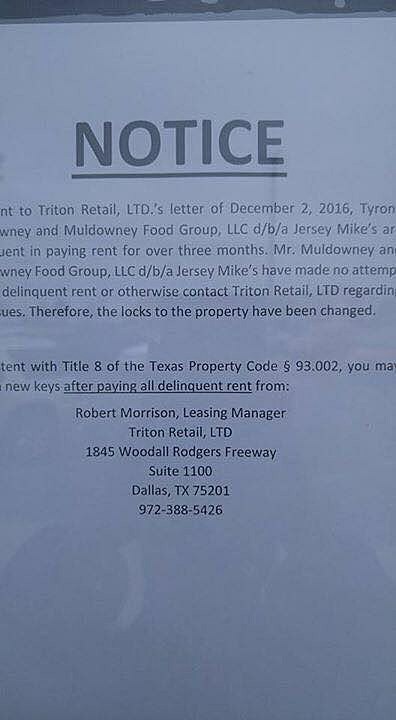 According to the notice, Jersey Mike's has not paid their rent in three months. This comes not too long after Reef Street shut their doors next door. Why do you think Jersey Mike&apos;s couldn&apos;t last in the Falls?